ENGAGE is a candidate research platform like nothing else I have ever seen. ENGAGE is the most robust passive candidate sourcing system available outside LinkedIn. ENGAGE is the world’s first AI-powered platform to combine Talent Mapping, Competitive Intelligence, Passive Candidate Sourcing, and Outbound Recruiting in one brilliant Candidate Identification and Engagement engine. 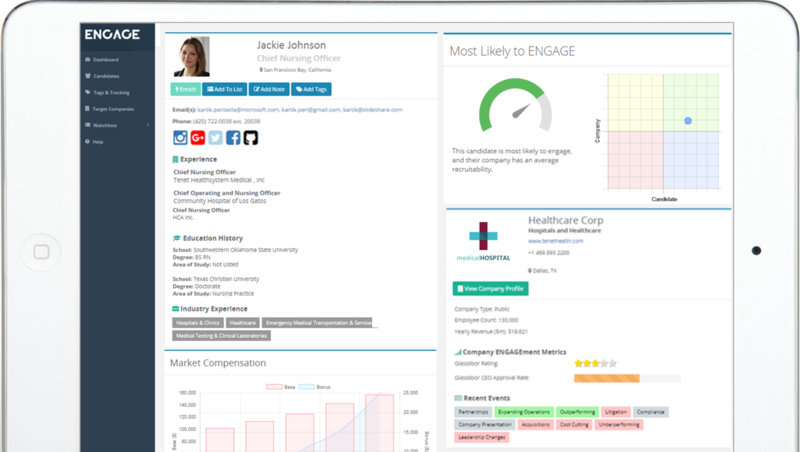 ENGAGE enables active recruiters to efficiently source from a live stream of over 100 million passive candidates or enrich their own CRM and ATS candidates with predictive, AI based insights. ENGAGE continuously monitors your candidates and alerts you with predictive availability signals when a candidate is likely ready for a new opportunity. Recruiters who leverage ENGAGE’s predictive analytics are able to more than double their candidate engagement rates.